Find out the benfits of the Voice Over IP Technology and why your company should switch today! VoIP works just like a regular phone with just one key difference - how the phone call actually gets to your business. Instead of using the high priced telephone company's wiring, VoIP routes your phone calls directly to your telephone using your high speed internet connection. You hear a dial tone and make your phone calls just like you've always done. What's changed is that you don't pay a big bill to use the phone company's wires. Taking all of the concepts and features of an analog PBX and hosting them on the Internet allows for ease of use and a greater level of flexibility. All of the features exist on the VoIP provider's network which eliminates the need for an onsite PBX. This turns any building with internet connectivity into an office. It can be a home, warehouse or coffee shop as long as there is an internet connection and an endpoint. With EPBX, a user can make configuration adjustments to their service from a web portal. Also, the employees within the company can exist anywhere but can all be managed under the umbrella of the EPBX system. The scope of support is expansive and covers anything that is directly within the service provider's umbrella. This includes all of the hosted features and communications with the end points. SIP Trunking is a product that is geared towards the customer who already has an IP PBX or an understanding of how they work. With this product the service provider is only there to send and receive calls to the IP PBX. 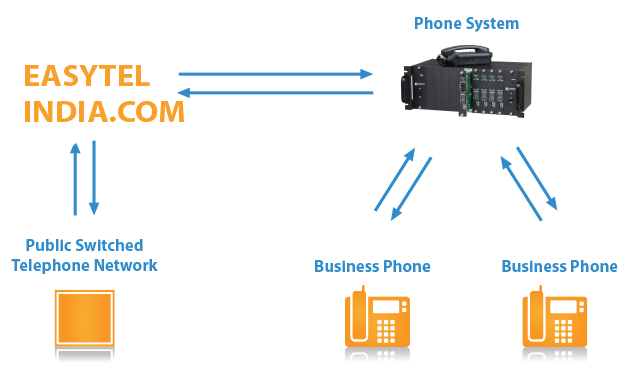 The IP PBX conceptually emulates the analog PBX in that all of the features and lines are configured there opposed to Cloud PBX where everything is configured with the service provider. The scope of support is limited to the signaling between the service provider and the PBX and does not extend in to the customer's personal network or configuration.